A cappella setting of the Latin "Lamb of God" text, open scored for SATB with lots of independent movement in the voices. (Piano cues double the voices to facilitate the learning process.) The ACDA Choral Journal wrote, "Its lush chords and well-constructed vocal lines will be a welcome addition to the repertoire of any well-trained choir." Stunning during the Lenten season. Suitable for Mother's Day, Father's Day, Children's Day, Christian Family Emphasis, Child dedication or Baptism services. "Lord, humbly we thank you for giving us the gift of children..." (parents, or mothers, fathers). Using God's design for home and family as a picture of the relationship we have with God, we are encouraged to appreciate these gifts. The congregation may be incorporated by teaching them the chorus. Optional flute part is included in the score, and guitar, bass, and electric piano parts are available separately. Lovely, thought-provoking anthem is suitable for observances of the Lord's Supper, Communion services, or Passion Week. The text by John Parker and Ruth Elaine Schram, full of passion imagery, is written from the viewpoint of the apostles as they tried to understand what Jesus was about to do. Correlation is then made between the apostles and the modern Christian with phrases such as "Jesus died on Calvary, broken there for you and me. On His brow, it was our crown He wore." The anthem ends with the statement of faith "We know Him as the chosen Lamb of God, because He broke the bread." The beautiful melody brings out the emotions that must have been and still are felt by those who believe. An optional cello obligato (included in the score) adds the crowning touch to this tender anthem that reflects the mystery and wonder of the incarnation. Specifically designed for the observance of Communion during the Christmas season. The cherished praise chorus "As the Deer" by Martin Nystrom is incorporated into a warm, inviting original work by Ruth Elaine Schram, originally appearing in her Easter cantata "Dawn of Resurrection." The beautiful chorus opens this intimate statement of faith and praise. With quiet grace and elegance, the charming communion hymn is a tapestry of beauty that is both musically and lyrically satisfying. Perfect for Lent, Holy Week, or Communion Services throughout the year. This exquisite setting of Psalm 51 which captures a new adaptation of that familiar passage works equally well for children's choir, women's voices, or mixed voices. "Wash me and I'll be brighter than snow..."
This winsome musical invitation to come to the table of the Lord and share the communion feast was written by Ruth Elaine Schram and her daughter, Celsie (Mrs. Robert) Staggers. Independent lines between the upper voices and lower voices enhance the beauty of the message. "No one need go hungry; no one need thirst again. Come be filled, come, be fed." The winsome lyricism of this sacred song is the perfect companion to the warmth and assurance of a communion gathering. Crafted as a choral invitation to approach the table of grace with hope, it encourages the listener to be part of the body of Christ. This easily learned anthem by Paul Baertschi and Ruth Elaine Schram is nonetheless profound in its effect. Whether accompanied by the calming piano part and optional violin solo (included in score), or by the worshipful piano and string orchestra (orchestration available separately), this anthem will have a lasting effect on the listener. "Cover the earth with a cloud of darkness. Cover the earth with a blackened sky. Hide Calvary's pain 'neath a veil of tears that the eyes of heaven cry..." Beautiful, poignant song for Lent or Holy Week. Optional oboe part (included in the score) adds a haunting, unforgettable touch. This dramatically compelling anthem by Ruth Elaine Schram and Scott Schram is suitable any time of year, yet perfect for Lent or Holy Week, or for that difficult Sunday after Christmas. The moving text is set to powerful music and will provide an unforgettable moment in your worship service. "You came into the world as a tiny child, small and unassuming. From Your first conscious thought, You knew Calvary was before you, looming. You knew Who You were, what You would do, why You had been sent to this place: to face the cross..." Stunning and breathtaking; for SATB or SAB voices with the option of using soloists on the first verse. This Orchestration premiered by Faith Academy, Manila, the Philippines. This moving and unforgettable Communion anthem with flowing lines and a beautiful piano accompaniment also features a lovely flute obbligato. It quietly soars with a message of faith and assurance in Christ's ultimate sacrifice. "In the Lord's house we find that the table is spread with a fountain of wine and a banquet of bread..." Psalm 34:8 is also quoted: "Taste and see that the Lord is good, feast your heart and soul on the sacred food..."
The mood surrounding communion is one of contemplative grace, and this lovely selection mirrors and enhances that atmosphere. The optional flute part adds a peaceful timbre to the unobtrusive accompaniment and distinctive melody. This work gives each of us a powerful invitation to "share in the Feast of Heaven" as we partake of the elements. Prayerful communion anthem with gentle, flowing accompaniment and delicately painted text ..."Sustenance for my spirit, basic elements, yet divine; cleansing for my soul in the gifts of bread and wine. A new covenant based on mercy, the Father's grace revealed. In communion with you, Lord, I am healed..." Gorgeous string parts (available separately) will create an unforgettable worship experience. This highly accessible 8 minute mini-musical for unison / two-part children&apos;s choir tells the story of the final week of Jesus&apos; life from Palm Sunday through Easter. (Anthems may also be done separately during Holy Week.) Weaving traditional melodies with original melodic material, and providing charming narration in verse form, Ruth Elaine Schram has created a lovely work well suited to the abilities of children, yet rich in meaning for all who hear. Parts for flute, two clarinets, cello, handbells, piano and percussion are available separately for live orchestra, in addition to the Accompaniment CD. Titles include "Joy on That Day," suitable for Palm Sunday, "Table of Love" for Communion / Maundy Thursday, and "Hallelu! He Lives!" for Easter Sunday. This brilliant text takes us on a journey of Christ's life through hands which took the impact of childhood falls, felt the textures of wood in a carpenter's home, blessed bread to feed multitudes, healed the sick, washed feet, and ultimately bore the scars of crucifixion on a cross. It is a moving anthem sure to inspire choirs and congregations alike. Available SATB or SAB, with beautiful orchestration that will not overwhelm even a smaller choir. (From the cantata for Holy Week or communion, "The Living Last Supper". Orchestration includes parts for flute, oboe, clarinet 1 & 2, percussion, Violin 1 & 2, Viola, Cello, Double Bass.) Suitable for Lent, or observances of the Lord's Supper throughout the church year. Lively, upbeat invitation to our Comforter to reveal Jesus' love, fill us with power, console us, and light the flame that burns within us. Perfect for Pentecost or suitable for general use. Suitable for Lent, Communion services, or general use. Beautifully orchestrated for flute, oboe, 2 clarinets, Percussion (wind chimes and suspended cymbal), Violin I and II, Viola, Cello, and Bass. All instrumental parts are optional and work with the piano to support and augment, but not overwhelm, the voices. Three scenes from the life of Christ where He experienced physical thirst are presented in this moving anthem. From the manger to the 40 days in the wilderness to his last moments on the cross, this anthem reminds us that ironically Jesus is the "Living Water" for our spiritual thirst. An optional communion text is provided for additional use as an offering for your time at the table with the Lord. Suitable for Holy Week, observances of the Lord's Supper, or explorations of the Seven Last Words of Christ. Included in the Lorenz work "The Living Last Words" (55/1134L - SATB; 55/1135L - SAB); Instrumental score and parts may be licensed from Lorenz. Contact me for details. Providing a rich context for why Christians celebrate communion, this anthem will enrich your congregation&apos;s observance of Jesus&apos; last supper. With or without the available orchestral parts, the lilting melody and lyrical accompaniment set a tender mood for a text that describes the Savior&apos;s final meal with His disciples. From the Lenten tenebrae musical, "Tapestry of Darkness." Beautifully orchestrated Accompaniment CD available, or Score and Parts for Winds, Strings, Percussion, and French Horn for live orchestra. The table of grace is the focus of this sacred song bringing to the choir loft a special opportunity to offer a ministry of mercy and hope. Incorporating a classic hymn text by Reginald Heber, the music (EUCHARISTIC HYMN by John S. Hodges) weaves an inviting spirit throughout the arrangement. Logical voice leading and a flowing piano accompaniment beautifully work together for the success of your ensemble. Gorgeous blending of "Let All Mortal Flesh Keep Silence" and "What Wondrous Love Is This," creating an anthem suitable anytime during Advent, and perfect for Christmas Eve Communion services. Lovely flute part is included in the score. Available for SA(T)B voices or Two Part Mixed. The beautiful, thoughtful text by David Davenport is given focus by an expressive melody and supportive accompaniment. Part for optional flute (or other C-instrument) is included. Suitable for Communion services, Lent, Holy Week, or Good Friday. This vocal soloist collection is filled with heart-felt songs of devotion to Jesus and hymns that focus on His Name. The varied seasonal themes ensure that this resource will be used throughout the church year with songs suitable for Advent/Christmas, Lent, Stewardship Emphases, and general services. Versatile, it includes optional synthesizer parts to provide a sparkling performance option when used with the piano accompaniment. An accompaniment CD is included for rehearsal or performance purposes, and it contains two bonus tracks: a live orchestral accompaniment to "His Hands," and a live string accompaniment to "Christmas Grace." This gentle yet powerful anthem is useful throughout the church year, especially for baptism, child or family dedication, Mother's or Father's Day, teacher ordination and stewardship. Based on Ephesians 5:1-2, a narrator begins (optionally) by quoting "Be imitators of God, as dearly loved children, and life a life of love." Then the children begin by singing "Little eyes are watching you. Be imitators of God." Then the adults come in: "Little eyes are watching me, watching everything I do. Little imitators, watching; Lord, help me be like You..." Very effective. A Dramatic Musical Experience for Holy Week or other observances of Communion. The set is based on the brilliant portrayal of the Last Supper by Leonardo Da Vinci, music and script by Ruth Elaine Schram. Suitable for choirs of all sizes, easily accessible for smaller music programs in SATB or SAB. Highly expressive anthem incorporating the beloved hymn, "My Faith Looks Up To Thee," by Lowell Mason and Ray Palmer, focuses our attention on the cross where Jesus died. (This portion may be sung a cappella or the piano may discreetly double the voices.) Appropriate throughout the church year, especially during Lent and Holy Week. May also be used for Communion services. Jesus the Servant / King is the focus of this touching anthem for Holy Week or Communion observances. Luscious melodic treatments carry a message of humility and grace into the heart of the listener. A sensitive piano part covers the whole octavo in a blanket of beautiful sounds and thoughtful voice leading makes for a very positive learning experience. Sometimes it is appropriate to pause in a moment of worship to contemplate the mystery and depth of God's love for His people. Ruth Elaine Schram and Paul Baertschi have created a solemn and powerful piece for these moments that are fitting and so necessary throughout the Lenten season. A memorable and expressive melody is perfectly complemented by a delicate, flowing accompaniment and optional oboe obbligato. Lovely, flowing Communion anthem that utilizes layered vocals and echo to gently drive the message home. "Pass the bread, pass the wine. At the table of the Lord, we dine with Jesus. Pass the bread, pass the cup. We proclaim our Lord's death, until He comes again...."
The seasonal collections of "Prayludes" by Ruth Elaine Schram have been received warmly by church musicians for the beauty of her arrangements and their flexible service uses. This collection contains nine creative medleys of hymns, gospel songs, and spirituals, and each gives you a variety of starting and stopping points to allow for the varying lengths of communion services. Each medley is also designed to flow smoothly into the following piece for times when longer musical meditations are needed. "Prayludes for Communion" will be one of your favorite resources for years to come. Songs include "Let Us Break Bread" ("Let us Break Bread Together" with "There&apos;s a Wideness In God&apos;s Mercy"); "Lord Jesus, Break the Bread" ("Break Thou the Bread of Life" with "Fairest Lord Jesus"); "My King, My Shepherd" ("The King of Love My Shepherd Is" with "He Shall Feed His Flock"); "Holy Jesus, Lover of My Soul" ("Jesus, Lover of My Soul" with "Ah, Holy Jesus"); "Partake the Bread of the World" ("O Thou Who This Mysterious Bread" with "Because Thou Hast Said" and "Bread of the World in Mercy Broken"); "Mercy in the Silence" ("Let All Mortal Flesh Keep Silence" with "Depth of Mercy"); "In Memory of His Mercy" ("In Memory of the Savior&apos;s Love" with "Only Trust Him"); "Feast of Glory" ("Come Sinners to the Gospel Feast" with "To God Be the Glory"); and "What Wondrous Love for Me" ("What Wondrous Love is This" with "Here, O My Lord, I See Thee" and "And Could It Be"). This ballad incorporates the beloved Spiritual "I've Got Peace Like a River" to create a beautiful song of assurance and praise. The fluid piano part imitates the flowing water, and the optional flute part introduces the hymn tune later sung by the men. Suitable any time during the church year for general use, during Lenten services, or for baptism. The wonder and joy found in the observance of communion are expressed in this melodic new offering. Tender words by Bert Stratton and Barbara Furman will warm the heart and remind everyone that there is place for us at the banquet of grace. Music of moderate difficulty allows for maximum attention to be paid to the interpretation of the flowing lines. Lovely accompaniment supports the voice parts. Suitable for Lent, Maundy Thursday, Holy Week, or observances of the Lord's Supper. Beautiful Piano Solo arrangements of reflective hymns are augmented by optional instrumental obbligatos for various instruments including French Horn, Trombone, Cello, Trumpet, Clarinet, Flute and Violin. Instrumental parts downloadable in a variety of clefs and voicings, giving many of your church musicians an opportunity to share their musical gifts with your congregation. 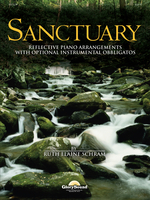 Fresh, creative arrangements by Ruth Elaine Schram and Walter Knapp in this useful resource for your music program. Sensitive lyrics by James Montgomery are framed with lyric melodies and warm harmonies in this setting by Ruth Elaine Schram. Suitable for Communion or Lord's Supper services. "...Be known to us in breaking bread, but do not then depart; abide with us; O Savior, spread your table in our heart..."
"Beyond the tapestry of darkness, the light still shines...." Comparing the events of Jesus' final hours to an ever darkening tapestry of green, brown, white and red, Ruth Elaine Schram has written a truly poignant work for Holy Week for choir and orchestra. Delightful collection of three children's anthems for unison / opt. 2-part voices and keyboard. Appropriate for Palm Sunday, Holy Week, Lent and Easter, each of the three anthems has optional narration. Anthems included are; "Hosanna!" for Palm Sunday, "Welcomed Home Again," for Maundy Thursday or any communion service, and "Jesus Rose" for Easter Sunday. "InstruTrax" accompaniment CD (orchestrated by Tim Hayden) is available separately. This poignant song begins with unison children's choir (or soloist) singing, "Through the window, I can see you. I am playing, you are praying; praying for me, faithfully praying; praying for my future, praying for my friends, praying for our family. May those faithful prayers never end..." Then the adults sing, from the other perspective; as though watching through the window as their children play, while they are praying for their family. A beautiful sentiment, as the song progresses to say "May God's hand of blessing reach unto your children's children..." A perfect choice for family emphases, baptism or dedication services, or general use. One of Alfred's "Sacred Super Seven Anthems of Distinction," this Communion classic features unforgettable melodies and rich harmonies, highly expressive yet easily prepared in several voicings. Suitable for Holy Week or Communion Services any time of the year. In this moving anthem, Ruth Elaine Schram seamlessly combines a haunting melody with striking harmonies evoking a strong, prayerful passion. "...Where You lead me, I will follow; Where You send me, I will go...." The intimate text and flowing arrangement for SATB and keyboard give us one of Ruthie's most powerful pieces to date. Perfect for ordination services, baptism, missions emphasis, stewardship, or general use. Thought-provoking study of the angels' function during the crucifixion of Christ. We surmise that they ministered to the Father who could not look at His Son when He took our sin upon Himself. In the chorus, voices ask the question "Where are the angels?" while others answer "They fold their golden wings to hide their crying eyes." Stunning! Suitable any time during the Lenten season, but especially meaningful on Maundy Thursday. This work provides thoughtful insight into the humanity and divinity of Jesus. "With those hands, he healed the sick; with those hands, he raised the dead; with those hands, he cured the leper; with those very hands he broke the bread ... Those hands that have known only mercy will be stretched from limb to limb upon a tree. And those hands, which have shown only kindness will be bleeding and broken for me." A truly moving work for Lent or Holy Week, also suitable for observances of the Lord's Supper. Dedicated to her parents, this lovely song from the pen of Ruth Elaine Schram is perfect for Mother's Day, Father's Day, Teacher Dedication, Commissioning services, or as a tribute of appreciation to a retiring minister or teacher. "...You were the face of God we saw, and the voice of God we heard, and the hand of God we touched, we touched. You were the hope of heaven here, and the joy of heaven now, and the heart of heaven to each of us; to each of us, you are the love..."